St. Thomas, US Virgin Islands. Register now and receive a brand new K3 Pursuit 20-Liter Hybrid Backpack. Organizers of the 2018 St. Thomas International Regatta (STIR), set for March 23-25, 2018, are pleased to announce the sponsorship of The K3 Company and its newest product as this year’s regatta skipper’s bag. The K3 Company’s support of STIR includes the provision of two other high-quality outdoor marine gear products. 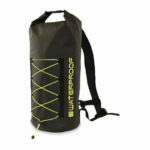 One is the K3 PRO-TECH 10-liter dry bag. Built with ultra-rugged construction and water tight seams, this product offers supreme functionality and un-mistakable class for the stylish sailor. The second is the K3 40-liter Excursion Duffle. Derived from tough tarpaulin laminate and a heavy-duty flex base, key features include quick-release ergonomic backpack straps, internal mesh zip pocket(s), an internal zip wet/dry pocket, compression straps, twin haul handles, an external mesh zip pocket, hefty shoulder strap, double stitching, and lockable zipper. It’s definitely the ‘liter of the pack’. These prized products will be awarded to class winners in the Round the Rocks Race, set for March 22, and for STIR. Not a skipper? Not a class winner? No worries! From now through March 31, K3 is offering an exclusive 30% discount as part of its STIR sponsorship. 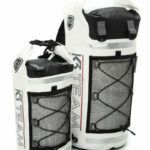 For those in need of travel and/or active gear, please check out the K3 website at: www.thek3company.com. Utilize coupon code STIR2018 @ checkout. The K3 Company is a global manufacturer and distributor of premium outdoor gear and accessories, and a worldwide leader within the waterproof gear and accessories sector. Through an untiring commitment to innovation and original designs, K3 is recognized internationally for the functional and premium products the brand produces without the lofty price tag. K3 professionals strive daily to push the boundaries with leading edge design, so its customers can push the limits outdoors – on or off the water.